Have you met our new robot, Cue? 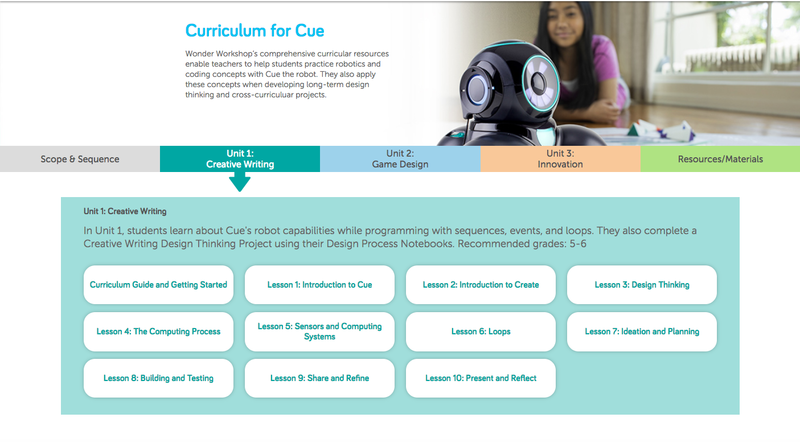 Cue was specifically designed with middle school students in mind. From the four different personalities you can select to the different programming paradigms available, the Cue experience focuses on two fundamental themes: voice and choice. As students enter middle school, we want them to take more ownership of their learning. With voice, students are given the chance to express their ideas and creativity. With choice, students are given opportunities to personalize their learning experience and make educated decisions. 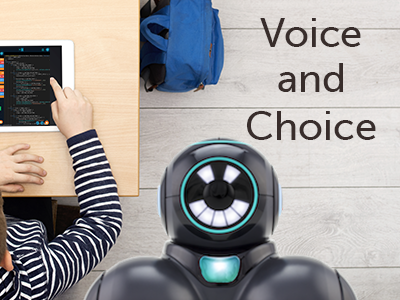 Thus, as we designed our Applied Robotics Curriculum for Cue, we also incorporated voice and choice as part of each curriculum component. Our Applied Robotics Curriculum provides teaching tools that help introduce robot capabilities tied to fundamental coding concepts. Students explore these capabilities in depth, using different programming paradigms. They then apply these capabilities to a long-term creative writing project as a means of assessment. Throughout the experience, students are provided opportunities to make choices in the programming language they use, the activities they complete, and the projects they design. Each long-term project also encourages students to express their voice through themes such as creative writing and game design! 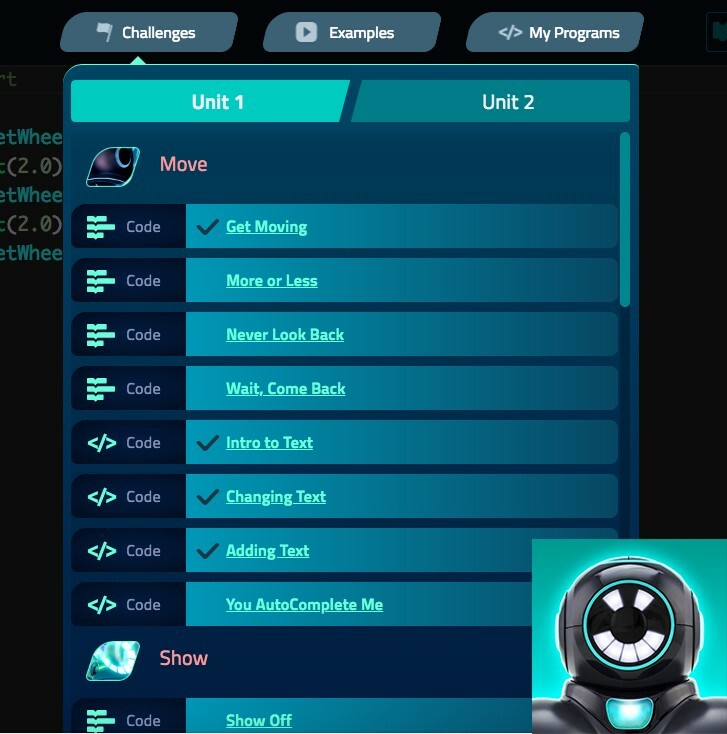 The app also introduces students to multiple programming paradigms. Students can choose to program using blocks, similar to Code.org and Scratch. They can also, with a touch of a button, convert their programming to text. 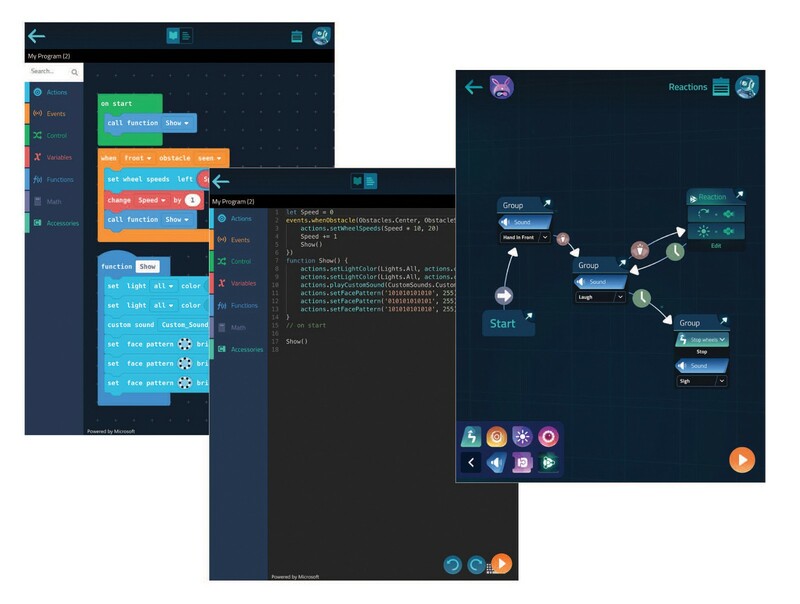 Additionally, they can program using Wonder, a revolutionary, state-machine programming language where students can arrange their code into patterns that are similar to flowcharts or decision trees. Whether students choose to program in blocks, text, or Wonder, they have the chance to express themselves with many features such as recording custom sounds and LED eye patterns! Our Design Process Student Notebook is also full of voice and choice! 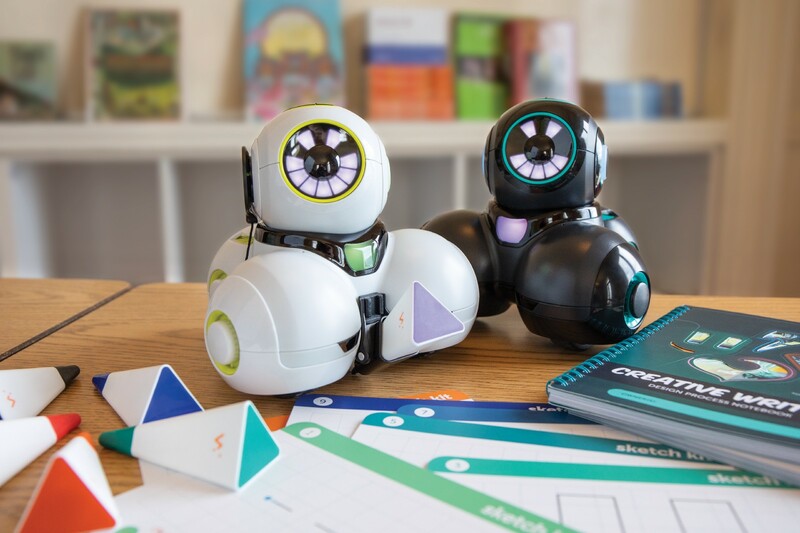 The notebook includes Activity Menus in which students can choose one of four short activities that help them practice fundamental robot capabilities and coding concepts. Each Activity Menu is followed by graph pages with prompts to help students plan out, test, record, and reflect on the programs they develop to complete each activity. Along the way, students are also given the opportunity to choose one of three long-term creative writing projects. Each project encourages students to express a story or idea using their robots! The notebook breaks down the project into phases so that students can tackle the project one step at a time. For a limited time only, we are offering our Curriculum Guide as a free digital download! Additionally, the guide provides best practices and implementation strategies on how to best incorporate Cue into your classroom! Finally, we have 10 free lesson plans on our curriculum website. These lessons help you introduce different coding concepts to your classroom by using our in-app content and Design Process Student Notebooks. They also delve deeper into each step of the design thinking process and introduce computing system concepts as well! Our lessons incorporate connections to Code.org’s CS Discoveries course and are designed to meet Computer Science Teacher Association (CSTA) and International Society for Technology in Education (ISTE) standards.